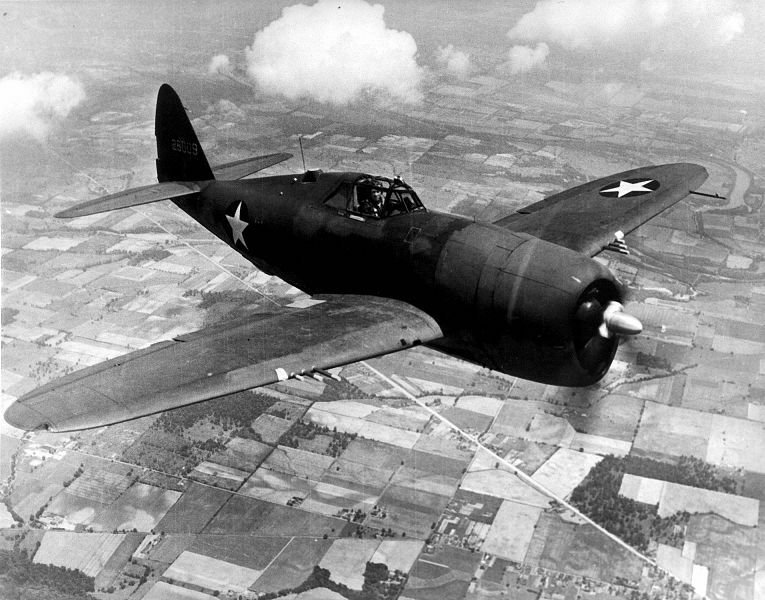 On this day in 1941, the Republic P-47 Thunderbolt had its first flight. The P-47 was one of the largest and heaviest fighter aircraft to ever be powered by a single piston engine. It was armed with 4 .50-caliber machine guns in each wing and could also carry five inch rockets or 2,500 pounds of bombs, enabling it to perform as a strike aircraft. When fully armed, it could carry over half the payload of a B-17 bomber. It was one of the main fighters of the United States Army Air Forces and also served with other Allied forces, most notably France, Britain and Russia. Air forces of Mexico and Brazil that fought along side the US were also equipped with the P-47. During its production, 15,678 P-47’s were constructed. Production ceased in October of 1945. Thousands more were on order but the end of World War II brought its production to an end. A number of P-47’s still survive, with some still flying and others on display at various museums throughout the United States and the world.